Communications are key to the success of disaster mitigation, preparedness, response, and recovery. Accurate information disseminated to the general public, to elected officials and community leaders, as well as to the media, reduces risk, saves lives and property, and speeds recovery. Disaster Communications in a Changing Media World, Second Edition, provides valuable information for navigating these priorities in the age of evolving media. The emergence of new media like the Internet, email, blogs, text messaging, cell phone photos, and the increasing influence of first informers are redefining the roles of government and media. The tools and rules of communications are evolving, and disaster communications must also evolve to accommodate these changes and exploit the opportunities they provide. 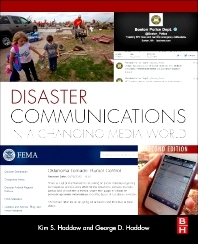 Disaster Communications in a Changing Media World, Second Edition, illuminates the path to effective disaster communication, including the need for transparency, increased accessibility, trustworthiness and reliability, and partnerships with the media. How did This Evolution Occur?